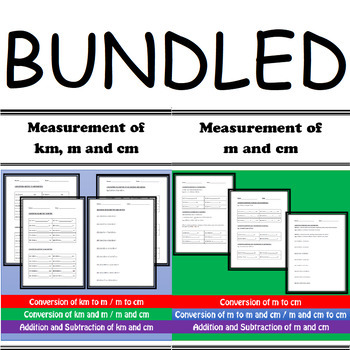 This bundle includes NO PREP practice for the conversion of Kilometers, Meters and Centimeters. The two worksheets, Measurement: Conversion of Meters and Centimeters & Measurement: Conversion of Kilometers, Meters and Centimeters come with answers. 1st Practice: Converting meters to centimeters, meters to centimeters. 6 questions each. Basic level as it only deals with whole numbers. 2nd Practice: Converting meters to centimeters, meters to centimeters. 6 questions each. Intermediate level as it inclusive of decimals. Addition of meters and centimeters. (8 questions) You can choose to let your students to convert it back to cm, m or m and cm. But the answer key is in terms of m and cm. Subtraction of meters and centimeters. (8 questions) You can choose to let your students to convert it back to cm, m or m and cm. But the answer key is in terms of m and cm. Practice 1: Converting kilometers to meters, meters to kilometers. 10 questions each. Basic level as it only deals with whole numbers. Practice 2: Converting kilometers to meters, meters to kilometers. 10 questions each. Intermediate level as it inclusive of decimals. Practice 3: Converting meters to centimeters, centimeters to meters. 10 questions each. Basic level as it only deals with whole numbers. Practice 4: Converting meters to centimeters, centimeters to meters. 10 questions each. Intermediate level as it inclusive of decimals. Addition of kilometers and meters. 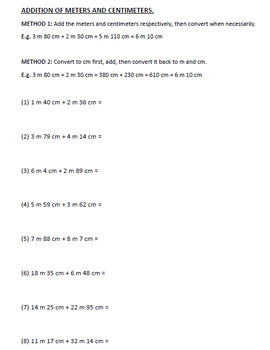 (9 questions) You can choose to let your students to convert it back to m, km or km and cm. 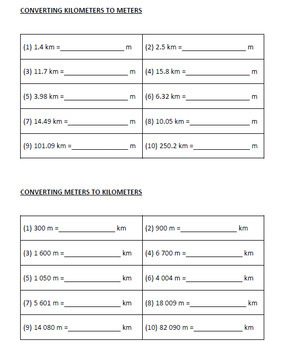 Answer key is in terms of m, km and m.
Subtraction of kilometers and meters. (9 questions) You can choose to let your students to convert it back to m, km or km and cm. 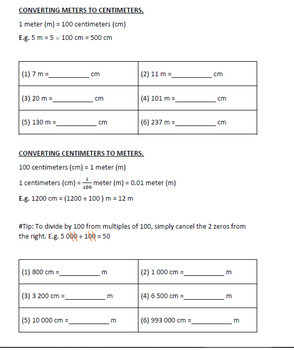 Answer key is in terms of m, km and m.
Addition of meters and centimeters. (9 questions) You can choose to let your students to convert it back to cm, m or m and cm. But the answer key is in terms of cm, m and cm. Subtraction of meters and centimeters. (8 questions) You can choose to let your students to convert it back to cm, m or m and cm. But the answer key is in terms of cm, m and cm.